Pochi minuti fa vi abbiamo svelato Miitomo, il primo gioco per dispositivi mobili edito da Nintendo in arrivo, grazie al publisher DeNA, sugli store virtuali a partire da marzo 2016. Miitomo sarà un gioco free-to-play con acquisti in-app, ma per il futuro Nintendo ha in serbo ben altro. I prossimi giochi mobili, da quanto rivelato durante la conferenza per azionisti che si è tenuta stanotte, saranno giochi a pagamento. Ciò non vuol dire che nei prossimi anni non usciranno altri titoli free-to-play sulla falsa riga di Miitomo, ma l’obiettivo di Nintendo è anche quello di lanciare giochi appunto a pagamento a fianco anche di possibili prodotti gratuiti in modo da raggiungere il maggior numero di utenti. Inoltre sempre stanotte Nintendo ha annunciato un servizio cloud based che permetterà agli utenti di trasferire dati tra i giochi per console e quelli per dispositivi mobili. Il servizio di membership Club Nintendo, recentemente chiuso, verrà sostituito da My Nintendo. Ci saranno notizie, gift, un programma a punti, merchandise e molto altro. Nintendo Account sarà invece il profilo utente da utilizzare su tutte le piattaforme a cui sarà possibile sottoscriversi sfruttando l’ID Nintendo, la propria e-mail, Twitter, Facebook o Google. A seguire parte della conferenza che Nintendo ha dedicato ai suoi azionisti. We are planning to introduce a new account system that connects all of these Nintendo experiences beyond platforms and operate a new membership service globally. It is generally said for any account system that more than half of people registering accounts quit halfway through the process. Every one of you must share the same experience of not being able to recall your account name or password when trying to log in. Accordingly, we have focused on making the new account easy to create or easy to sign up as well as easy to use, namely, it is harder for members to forget about it. Specifically, for our new account, you can log in with your Facebook, Google or Twitter account. Alternatively, you can log in with a combination of your email address and your password. Of course, you can continue using your Nintendo Network ID as well. The name of this new account system is “Nintendo Account.”With Nintendo Account as the basis, we will provide new membership services. Today, let me introduce you to a part of the service. Firstly, on Nintendo’s official website, you will be able to purchase digital download software for Wii U and Nintendo 3DS. When you find an interesting title after seeing articles or videos introducing new games through your PC or smart device, you can buy it on the spot, and the purchased software will be automatically downloaded to your Wii U or Nintendo 3DS. Also, in accordance with each member’s profile, purchase records and play records, we will send notices and gifts. For example, an Animal Crossing character called Isabel may send some information or a present to those who are playing with that game, Mario Kart players may receive a notice about add-on content and we may also send a message that enables the recipient to purchase some software at an attractive price point on his or her birthday. With the Club Nintendo membership service that was ended on September 30, 2015, you earned points when you purchased software. With this new point program, you can earn points by playing games as well. Whether you have played the software for dedicated game systems or our applications for smart devices, you can earn points that can then be used on our dedicated game systems or on smart devices. Naturally, you can also earn points by purchasing software. With the new points, you can obtain digital add-on content, which will make the game you are playing even more fun, original merchandise or a coupon, which can be used as a discount for new software. In terms of creating connections among the members, members can make friends with those who enjoy playing games together by establishing “Friend” relationships. As we place importance on the security of our consumers, a Friend relationship can be established only between two people who know each other and have consented to the relationship. This Friend relationship can be used for software for dedicated game systems and for our smart device applications. If I can discuss our plans for the future, the service will eventually allow game save data, such as character data, to be stored in our cloud system so that you can use them both for the software for dedicated game systems and for our smart device applications. 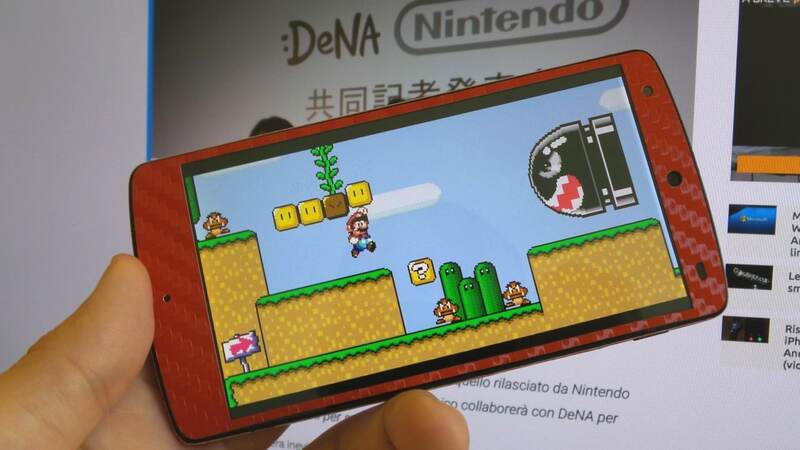 My Nintendo will work as a bridge between dedicated game systems and smart devices. Now, I would like to introduce you to a free-to-start type communication application for smart devices, namely, our smart device application, which can be started for free and will push forward the My Nintendo membership service. The main character of Miitomo is you. First, you create your own Mii. The Mii asks you a variety of questions and communicates your answers with your Friends’ Mii. The people you will be able to communicate with are limited to your friends whom you have registered as Friends. We are designing this communication application to enable Friends to share information comfortably and securely. In this way, instead of the users proactively sending their own messages, Miitomo has a unique characteristic that can be called “friendly communication starters” as your Mii will automatically dispatch the answers you gave to certain questions to your friends. These “friendly communication starters” have an advantage that even the people who are less willing to send messages can easily participate. Another unique characteristic of Miitomo is that you may be able to find out unknown aspects about your friends or unexpected commonalities you share with your friend because Miitomo may pick up the topics that you usually do not discuss but would be willing to answer if asked. What we would like to realize is, through such communication, you will be able to deepen friendly relationships and have more people with whom you can play games. Both My Nintendo and Miitomo will be available in March 2016. For reference, more than 200 million Mii characters have been created on our platforms, which means that many people around the world understand the appeal of Mii.